This is the first time I’ve heard of this brand. 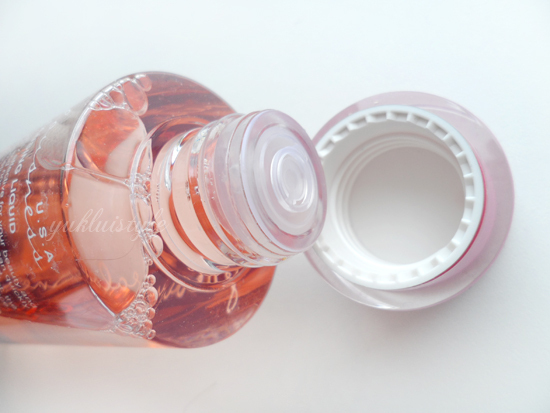 Jealousness USA is a Taiwanese brand carrying out a lot of cosmetics in girly packaging. Lots and lots of pink! Am lucky to try out one of their products. 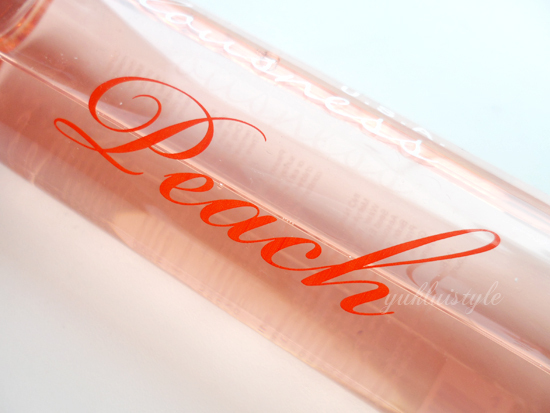 This cleansing liquid comes in two formulas, rose (dry/sensitive skin) and peach (combination/sensitive skin, as above). Cute packaging but when you first open it, you can see that there is a little plug which you can pull off and put it back in which is great to prevent any spillages and leakage. When poured onto a cotton ball, you can smell the sweet peach scent straight away. In my opinion, I actually quite like it. It wasn’t a sickly or too sweet. 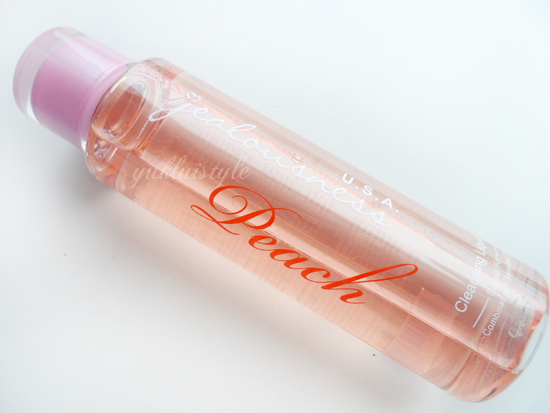 It smells more like a candy peach yet I’m unsure as to what a peach actually smells like. It lingers around but not for too long. As for the usage, am quite surprised as to how this effectively removed makeup. It had removed my eye make up well except for my eyeliner (MAC Liquidlast) which isn’t much of a surprise. It had removed my makeup with two cotton buds but I like to use a third to ensure any traces left over are removed. But, my skin had felt sticky afterwards which is new, however, it didn’t last. The stickiness disappeared after minute or so. Skin felt softer afterwards but I wouldn’t say hydrated. This isn’t an oil based product, its water and also alcohol free. This definitely doesn’t leave my skin feeling tight or dry. Quite gentle on my skin. This had worked out to be roughly the same price as Bioderma H2O but with less product. But of course, it depends on where you purchase your Bioderma. If you are sensitive to products with heavy scents, stay away as I have also read that the rose formula also has a strong rose smell. I actually quite like this but I wouldn’t say that it is better than my Bioderma Sensibio. I wouldn’t say I’d repurchase yet wouldn’t not repurchase it. It’ll depend on when I’ve finished it and my circumstances at that time. That's quite interesting, that it's peach scented. I imagine the slightly sticky feeling might have been because of that.